The Snowbee 3-in-1 landing net has a strong lightweight D frame with a knotless mesh net and comes with 2 telescopic handles. A short one for use as a hand net and a longer one for use on riverbanks and stillwaters. - Frame size is 16" x 20"
- Short handle for use as a hand net is 12" and telescopes to 18"
- Long handle for use on boats, banks, etc is 25" long and telescopes to 45"
- Both handles are lightweight aluminium with a quick and easy twist lock. It does exact what it says! Good piece of kit, perfect for my requirements for river and lake fishing. 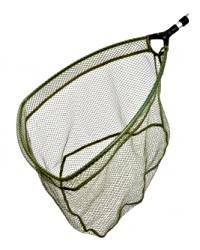 Excellent quality landing net at a fair and reasonable price. Very good landing net . Lightweight and versatile but a little difficut to carry around when handle detached from net.